Crochet. Who would have thought?? I'm learning the basic stitches so that I will be able to seam and finish my knitted projects painlessly in the future. 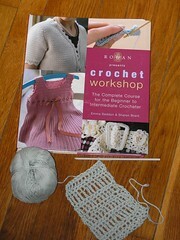 This Rowan book is great for beginners like me. I learned to crochet long before I learned to knit. I loved it because it rips out easier!! I've also found that people who knit continental find crochet easier than people who "throw" their yarn. I think all knitters should have some basic crochet skills. Crochet makes awesome edging and fun craft projects. For example, I like it better for stuffed toys for kids. It's like anything new! Once you get rolling you'll be a pro in NO time! !